U.S. patent data were received through http://patft.uspto.gov/. All other patent data were received through DEPATISNET. Drawings are details of the original, but otherwise unchanged. A copy of the patent specification can be downloaded here (TIF-files): Page 1, Page 2. This is a very early patent I found mentioned in John M. Whelan's book 'The Wooden Plane, It's History, Form And Function' (Astragal Press, 1993). From the statements in the patent description it can be concluded, that wedges to serve this function have been used even earlier. But they seem to have been sitting in an extra abutment, which 'greatly increased the labor of making the plane'. Kendall proposes a wedge with inclined edges, which runs down the front surface of the mouth opening without further modifications. A copy of the patent specification can be downloaded here (PDF-files): Page 1, Page 2. This patent actually is about two improvements of the hand plane, one concerning the mouth block (c) held in place by a wedge(b), to close the mouth (E). The other feature is some kind of pin (d) to secure the wedge. 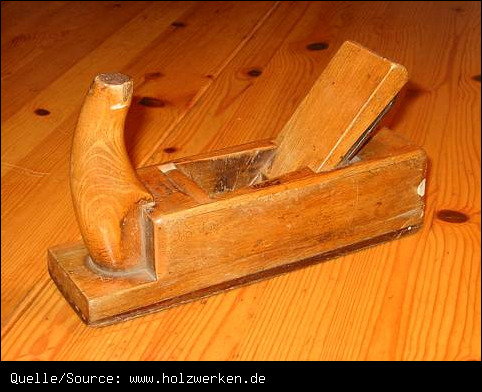 The plane is made of hardwood (hornbeam, apple or plum tree), with a boxwood or lignum vitae block. 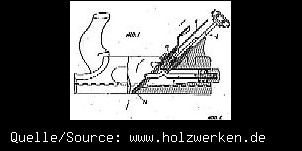 The text of the specification implies, that there is no earlier patent for a mouth block. 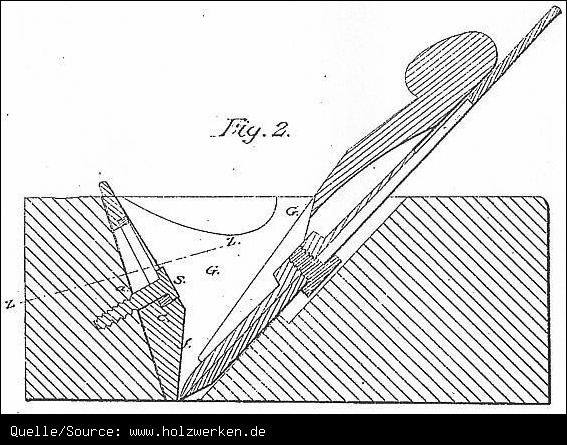 It is stated, that this patent avoids the shortcomings of wooden planes (excessive wear) as well as iron soles (higher frictional resistance, leave black traces esp. on oak). Further advantages of a mouth block are specified. It is possible to smooth low spots, if both the block and the iron are pushed a little downwards. The same method can be used to create a spring joint with a jointer plane. This patent tries to improve the mouth block by orienting the grain parallel to the sole. It is stated, that the usual end grain configuration leads to unequal wear between block and sole. The resulting block needs to be thicker and is held by a screw and a washer. A peculiar patent using an elongated mouth block as tote. The mouth block is merely mentioned, but not part of the patent. 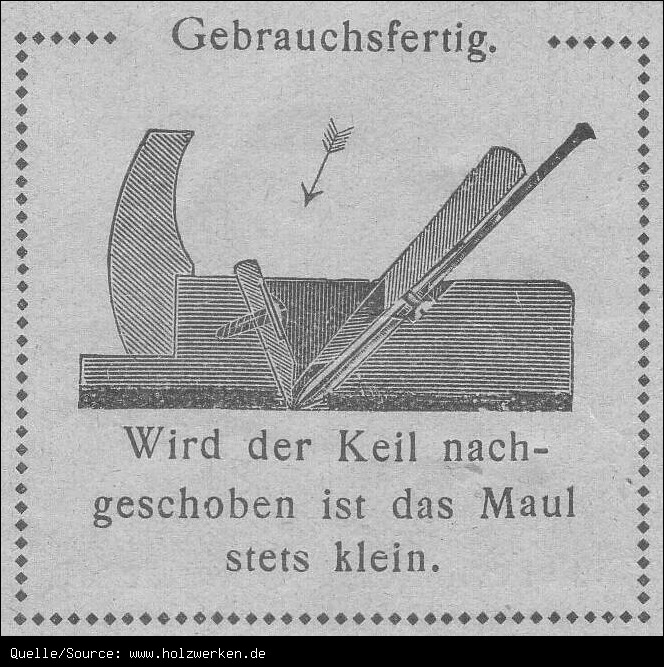 Planes with mouth closing wedges have been made by the German tool companies M. Hiessinger in Nuremberg since about 1920, J. C. Krehn in Fürth and Fr. Ott & Co. in Ochsenfurt/Main. Here are two examples of Hiessinger planes: plane 1, plane 2. 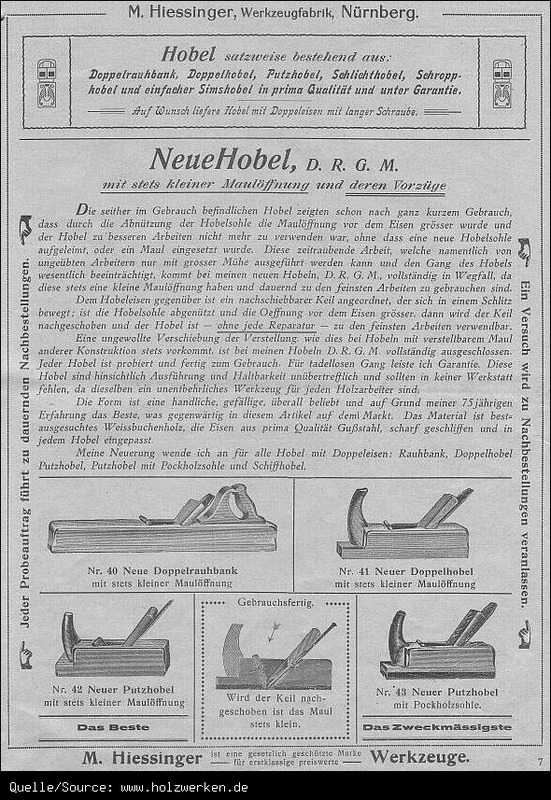 Corresponding page from a Hiessinger catalog from this time: whole page, detail. High quality japanese planes have wedges sitting in a wide dovetailed groove. They are adjusted with a hammer after trueing the sole, the protruding part is planed off.